The legend has it that princess Heo Hwang Hu from Ayodhya in India travelled to Korea and introduced tea to that country in AD 48. Nearly 2,000 years later, a group of Koreans is sharing their nokcha (green tea) and fascinating tea connoisseurs with their intricate tea ceremony, darye, in Darjeeling. A group of 25 South Koreans led by In-Oh Chung, director, Korea International Tea Research Institute, is in India not only to share their tea but also to learn about the brew produced in India. The programme organised by the Korean research institute in collaboration with Indo-Korean Foundation was held at Mayfair Resorts in Darjeeling yesterday evening. 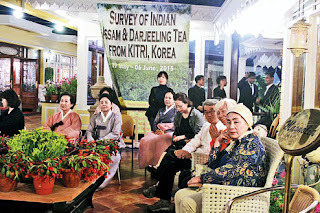 The event was supported by Korean Embassy, Tocklai Tea Research Institute and Korean Cultural Centre to India. "We have a very long history of tea in Korea. The legend has it that tea was brought to Korea by a princess from Ayodhya in India, whose Korean name was Heo Hwang Hu. She married King Kim Su Ro. We believe that she was from Ayodhya, near Varanasi, because the princess's symbol of two fishes can be found only in Ayodhya," said In-Oh. The group was composed of people mainly associated with tea business in South Korea. "In Korea, we mostly drink green tea ( nokcha) but slowly, people are taking black tea as well. We planned the visit to know more about black tea, the plantation and the manufacturing process. We visited Assam tea gardens before coming to Darjeeling. We will also be going to Gangtok for a visit to Temi tea garden," said In-Oh, through an interpreter. "We are also trying to showcase our tea culture here." The elaborate tea ceremony was conducted by Korean women, dressed in ham-bok, their traditional dress. Two rounds of tea drinking session took almost half an hour, which was accompanied by soft background music. "In this ceremony, the women believe they can put the energy of the universe from four different directions in the cup, which is placed in the middle," said In-Oh. The ceremony was complete with a tea leaf that was kept beside the cup to get a feel of the nature. "Tea ceremony is an event in which we show our respect to visitors in the most humble way," said In-Oh. Among the invitees to the tea ceremony was Amit Javalgi, police chief of Darjeeling. "It gives me great pleasure to invite you, on behalf of the people of Darjeeling, to the tea capital of India. We are also grateful to Dr A. Campbell, who first introduced tea to Darjeeling. Interestingly, Dr Campbell was also the police chief of the area then and I have the opportunity to stay in the house where he lived." Officials of the Tea Board of India, Indian Tea Association and local entrepreneurs were present at the tea ceremony.